A web-based user interface that provides a unique set of solutions, and utilities for each customer instance. Control is multi-tenant, allowing authorized users to navigate between administratively separate networks. Control includes user rights management, enabling different user types to be configured for different abilities and access. Within Control, users can perform lifecycle management of network devices including initial provisioning of features, change previews, updating of feature configurations, and the typical move/add/change/delete (MACD) activities. Control makes RESTful API calls to the Gluware Intelligent Orchestration Engine. Each network concept (or feature) managed by Gluware is constructed as a data-model, that delivers structured data which then fuels the orchestration engine. Gluware uses an annotated JSON format for these models, which is lightweight and enables rapid development. The data-models are customizable and can provide hard-coded values or user input fields with validation. The data-models are also used to dynamically generate a required form-fill input that is exposed in Gluware Control. The Gluware engine will also dynamically convert the data-models back to vendor-specific CLI or API during node provisioning. This feature is used during discovery when devices are first added to the Gluware platform for management. Device Detect dynamically discovers what OS/platform it is interacting with and captures all relevant configuration details for the device. Provides the ability for the engine to identify the specific changes to be made on a Node allowing the fastest possible updates with the lowest possible risk to the network. Whether the rules are applied by Network Best Practices (in SD-WAN) or by the User (Config Modelling), this is the ability for the engine to provision features on a Node based on business or network rules. Not only the right features, but the order in which they are deployed on a Node can be critical to success. Each vendor OS/Platform supported in Gluware requires a VSE which "teaches" the engine components the necessary CLI/API model and any other required rules, policies and procedures for that vendor. 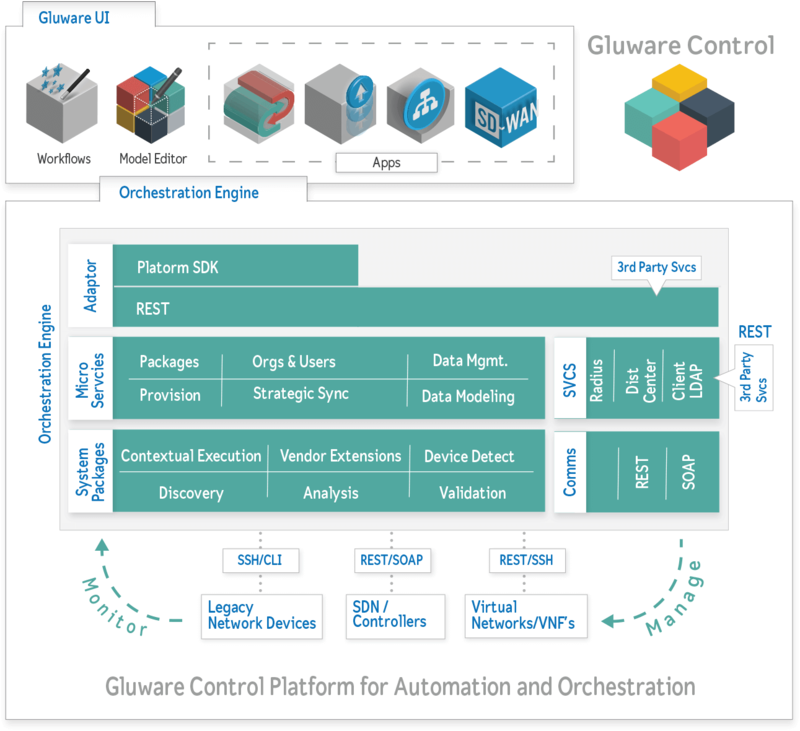 Developed over the past eight years, the Gluware Orchestration engine provides the underlying components to safely and securely manage IT networking device configurations at scale, across multiple customers. Built as a cloud-native application, it has many different service components and integrated databases that host a range of network automation packages. It is network-aware, with the ability to discover a devices' current state, analyze and compare it to the desired state for the device, and then perform deterministic provisioning on it - at scale. The Discovery Engine connects to each device during provisioning, or a connected preview, to capture the current state. It has the ability to read in the required features (via native CLI or API) and convert them into a usable data-model for use by other engine components. The Analysis Engine performs a comparison between the current state, learned in discovery, and the desired state, which are new or updated Gluware features being provisioned on the device. The result of this analysis is then used to declaratively provision the device, adding what is needed and removing what is no longer needed to its configuration. The Validation Engine provides an integrated policy and procedure enforcement mechanism. It has the ability to look at all the features being provisioned, and understand relationships and dependencies between them in order to ensure that provisioning can be completed. It also performs validation of the changes that occur during provisioning to ensure success. The Gluware Integrated Development Environment (IDE) is a complete platform that models, tests, and packages features for use in Control. This platform can also extend and customize engine components as well as existing solution packages.